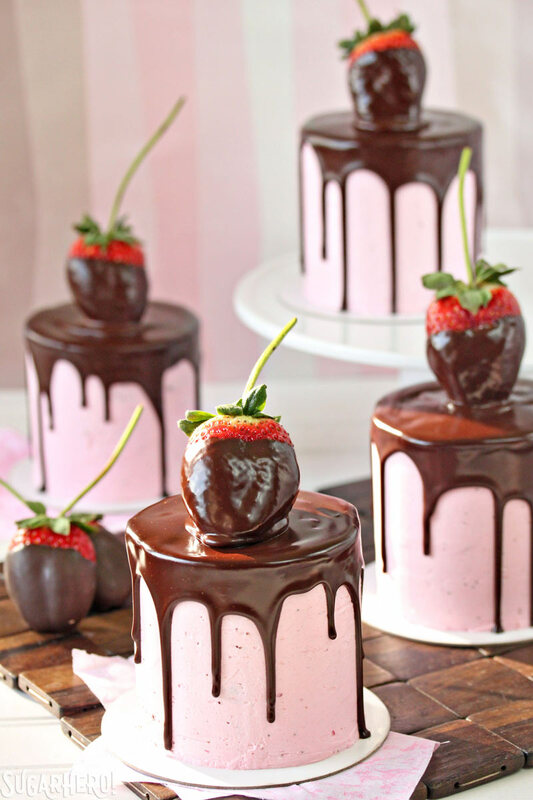 Chocolate-Covered Strawberry Cakes – nothing says love like one of these mini cakes! Moist chocolate cake, fresh strawberry buttercream, drippy chocolate ganache, and a gorgeous chocolate-dipped strawberry complete these romantic desserts. Sorry if I got a bit fresh right now, it’s just that looooove is in the air and I’m in a Valentine’s Day state of mind! Hard as it is to believe, we’re only a few weeks out from the pinkest, frilliest, lovey-dovey-est day of the year, and this time, I’m giving the holiday the full SugarHero treatment. Expect the next few weeks to be full of cupids, romance, long-stemmed roses, giant diamond necklaces, and lots of chocolate…or maybe just that last one. These mini desserts are like enjoying a chocolate-dipped strawberry in cake form! 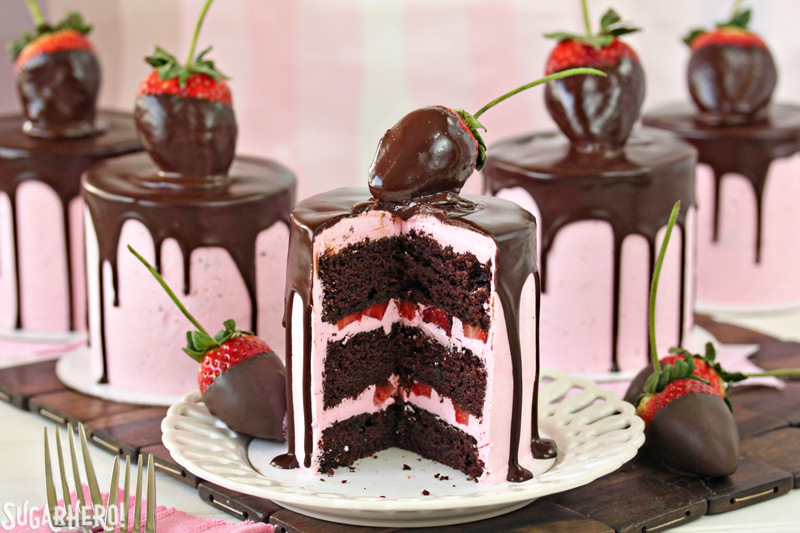 They start with moist chocolate cake, layered with a light and fresh strawberry buttercream. I added lots of strawberry puree to the frosting, to give it a bright, authentic taste. 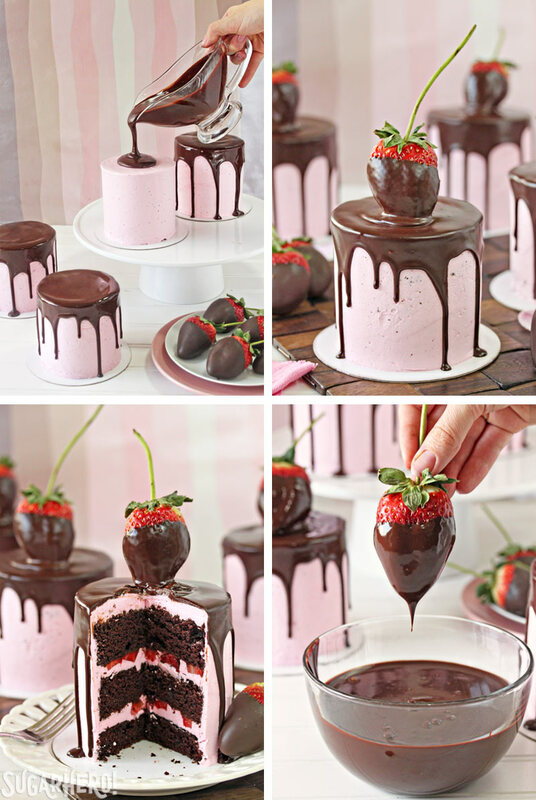 Then the cakes are coated with a dripping layer of chocolate ganache, and finished with a chocolate-dipped strawberry. This recipe actually got its start when I stumbled on these long-stemmed strawberries at the grocery store. I hadn’t even thought about making mini cakes, but the berries were so beautiful, so fat and red and juicy, that I knew they needed their own starring vehicle. I don’t run across long-stemmed berries very often, and if you can’t find any (or don’t want to pay the premium price) then any large strawberry would work just as well! These sweet little cakes are the perfect size to serve 2 people—how’s that for romantic?! Unless you hate to share, in which case I recommend you each eat a whole cake and then high-five over your selfishness. 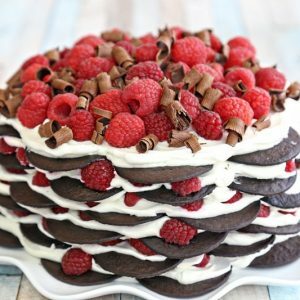 The recipe makes five 3-layer cakes that are only about 4 inches wide, so it’s not an overwhelming amount of dessert, and their small, portable size makes them easy to share with your favorites. 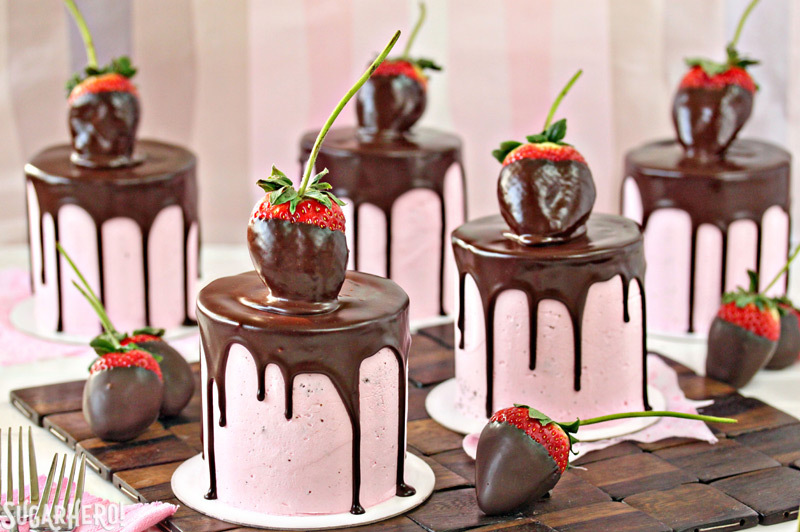 Chocolate-Covered Strawberry Cakes - nothing says love like one of these mini cakes! 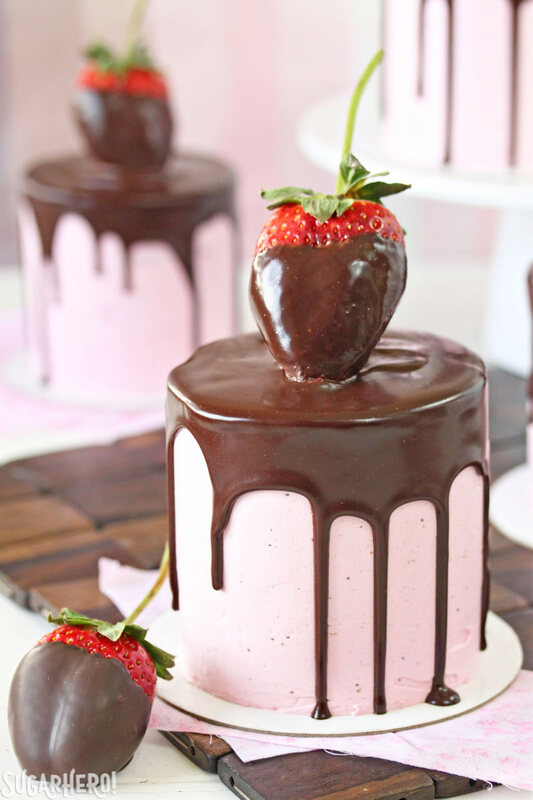 Moist chocolate cake, fresh strawberry buttercream, drippy chocolate ganache, and a gorgeous chocolate-dipped strawberry complete these romantic desserts. 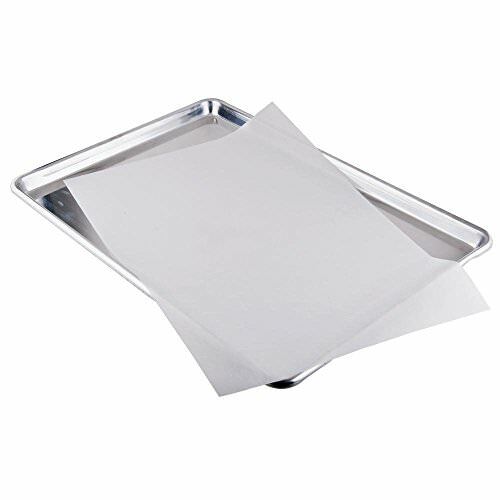 Preheat the oven to 350 F. Line a half-sheet rimmed baking sheet (18 x 13 inches) with parchment, and spray the parchment with nonstick cooking spray. When the dry ingredients are nearly incorporated, stop the mixer. Scrape down the bottom and sides of the bowl with a rubber spatula, and finish mixing the cake by hand. Pour the batter into the prepared pan and smooth it into an even layer. Bake the cake for 20-25 minutes, until a toothpick inserted into the center comes out with just a few moist crumbs attached. Cool the cake completely before using. 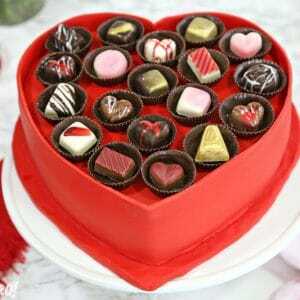 The cake can be made several days in advance and kept, well-wrapped and refrigerated or frozen, until ready to use. If you freeze it, make sure it's partially defrosted before you use it so you can cut it easily. Beat the whites on medium-high speed until they are a shiny, stiff, voluminous meringue, and are no longer warm to the touch—feel the outside of the bowl, and make sure that it is around room temperature. Depending on your mixer and the temperature of your environment, this may take 15-20 minutes, or more. Reduce the speed to medium-low and add the softened but cool butter in small chunks, a tablespoon at a time, making sure to wait in between additions. It may separate or look a little gloopy at this point—fear not. Once all of the butter is added, increase the speed again and whip until it comes together and is light and fluffy. 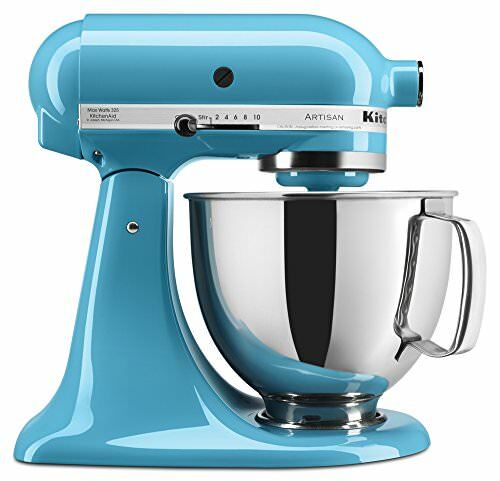 If, after 5 minutes, it hasn’t come together, refrigerate the mixing bowl for 5-7 minutes, to cool the mixture down, and whip it again until it has thickened and is smooth and silky. Add the vanilla extract and salt and beat until it is mixed in. With the mixer running, slowly add the strawberry puree in batches, letting it incorporate little by little. Adding it slowly will help prevent it from separating from the addition of the extra liquid. Once all of the puree is added, add a few drops of pink food coloring until you get a color you like. Place the chopped semi-sweet chocolate in a medium bowl and set aside. Pour the heavy cream into a small saucepan and place it over medium heat. Bring it to a simmer so that bubbles appear along the sides of the pan, but don't let it boil. Pour the hot cream over the chopped chocolate and let it sit for one minute to soften and melt the chocolate. After a minute, gently whisk the cream and chocolate together until it is shiny and smooth. If you won't be using it soon after making it, press a layer of cling wrap on top of the chocolate and refrigerate it for up to a week. To use it, gently re-warm it in short intervals in the microwave, whisking frequently, until it is fluid again. Use a 3 1/2-inch round cutter to cut 15 circles from the half-sheet cake. Space them as close together as you can, and don’t worry if an edge or two is not exactly round—that can all be smoothed over with frosting later. Wash and dry the 2 cups of strawberries. Hull them and chop them finely. Cut out five cardboard rounds the same size as your cake circles, and place a cake circle on each round. Spread a layer of frosting on top of one of the cake layers on a cardboard circle, and use an offset spatula to spread it out to the edge. Sprinkle some of the chopped strawberries on top, and press them down gently to embed them in the frosting. Top it with a second cake slice, then add a layer of frosting on top of that. Finally, finish it off with a third cake slice. Spread a very thin layer of frosting on the top and sides of the cake. This is the "crumb coat" and is just used to lock in any stray crumbs. 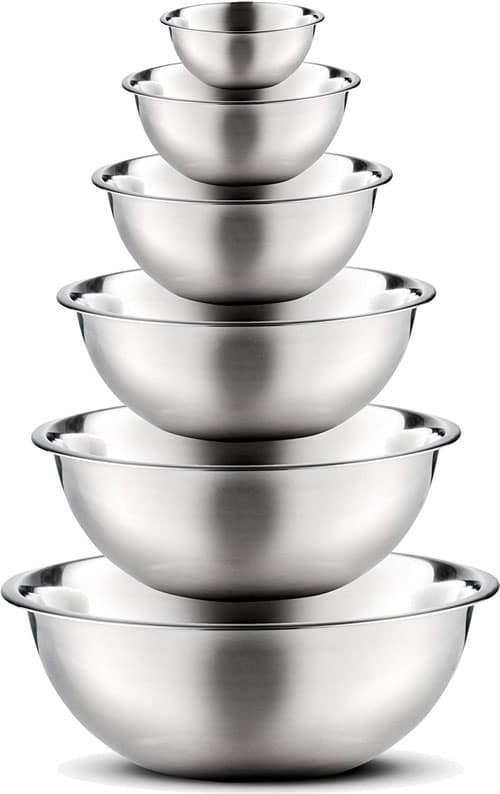 Repeat until you have assembled 5 mini cakes. Place the cakes on a baking sheet and refrigerate them for at least an hour, until the crumb coat is very firm. Re-whip the frosting if necessary, so that it is very smooth and not spongy. Add a thicker layer of frosting to the top and sides of the cake, covering the crumb coat, making sure the frosting is as smooth as possible. 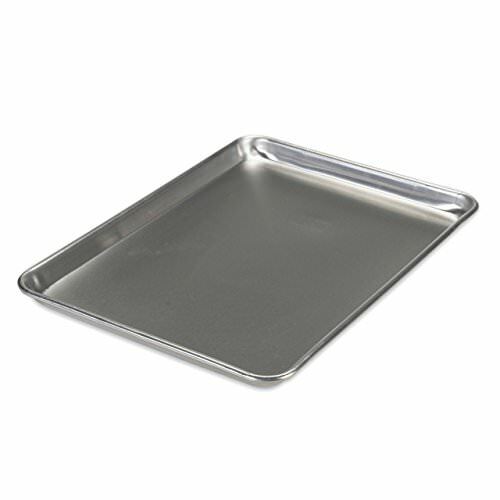 To get the sides extra-smooth, run a metal offset spatula under very hot water, then wipe it dry and run it along the sides of the cake—the heat from the spatula helps smooth out the frosting. Repeat until all of the mini cakes have a final layer of frosting on them, then refrigerate them again to set the frosting. Re-warm the ganache, if necessary, until it flows easily. Transfer it to a measuring cup with a spout, and pour some on top of a cake, until it goes almost out to the edge. Use a spatula to nudge around the sides of the cake, encouraging drips to go down the sides, until you've gone around the whole cake. Repeat until all of the cakes have a coating of drippy ganache. 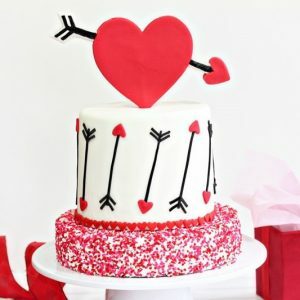 If you want your chocolate-dipped strawberries to stand upright on top of the cakes, insert a wooden skewer going all the way to the bottom of the cake and extending about 3/4-inch up above the surface. Make sure your strawberries are washed and completely dry. Dip a strawberry in the ganache until it is nearly covered, then remove it and let excess drip back into the pan. Prop it up on top of the cake, resting the back on the wooden skewer so that it balances upright. Repeat until all of the cakes are topped with chocolate-dipped strawberries. Refrigerate the cakes briefly just until the ganache is set, for about 20 minutes. For the best taste and texture, serve these mini cakes at room temperature. To make the strawberry puree, use approximately 8 oz of fresh or frozen strawberries. (If using frozen, defrost first.) Warm them over medium heat in a saucepan, mashing slightly to let them release their juice. Once warm, blend them in a blender or food processor until liquid, then pour through a fine mesh strainer to remove the seeds. Measure out 1/2 cup of puree for this recipe, and reserve any extra puree for another use. 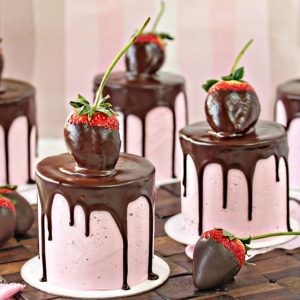 For another beautiful take on this idea, check out this lovely version of Mini Chocolate-Covered Strawberry Cakes for Two from my friend Natasha at The Cake Merchant! this recipe calls for 9 oz butter but what is that in cups? At the bottom of the recipe is states 350kcal. Is there really 350,000 calories in one of these cakes? Even if it is total calories for all 5 cakes and a serving is 1/2 cake, it would still be 35,000 calories per serving. Please tell me I have calculated this wrong. Also, how much butter is 9 oz.? Would it be 2.25 sticks of butter? Thanks. The cakes look beautiful! Hey Pam, I just updated the nutrition facts. Thanks so much for catching that. Hope that helps! Please could you give. E a price what l could sell strawberry chocolate cakes for ? Hey Duanna, I’m sorry but I can’t really help with pricing. It is going to be so unique to you because of ingredient costs, your time, and your area! Good luck! if i used powdered meringue, would the directions for the strawberry buttercream remain the same? Hi Irene, I haven’t tried powdered meringue with this buttercream recipe so unfortunately I can’t say for sure. 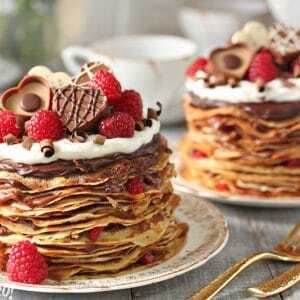 What advice do you have, if I were making these ahead of time, to prevent the strawberries from weeping onto the cake? Hey Calah, you can do the ganache drip ahead of time as well as dip the strawberries. I would just suggest placing the strawberries on the cake just before you are ready to serve them! It should turn out great. I would love to see pictures!